Today student video is increasingly common on campuses all around the world. Schools, colleges, and universities are recording more and more student assignments and presentations, challenging students to demonstrate expertise or model proficiency in a format that better approximates real-world scenarios than do traditional essays or exams. As other institutions adopt video on an assignment-by-assignment basis, however, the sheer scale of student video produced at the Sauder School of Business stands out. The Sauder team envisioned a class that wouldn’t just be a way for the students to learn about giving presentations — it would be a total presentation laboratory, a place to experiment, self-review and, finally, learn how to succeed as presenters. Fair and objective presentation grading and evaluation based on recordings that could be reviewed by the instructor at any time. The class that eventually came into being was called Business Communications, and today it’s a required course for all incoming students. But before it could begin, the team had to first answer the question of whether it could actually be done. To find out, Cameron Morrell, an instructor at the Sauder School of Business, visited a number of other universities to get ideas for how the course could be designed. After extensive research, Morrell concluded it was possible. How it could be done is the subject of our latest case study. The test complete, the team quickly realized that such a system simply would not be feasible for all 400 students. Then the team discovered Panopto. Panopto’s video platform runs on any laptop and accommodates virtually any recording device, from specialized camcorders to webcams, laptop cameras, and even smartphone and tablet recorders. Recording a presentation with Panopto is simple: just open Panopto, confirm the video sources you want to capture, click record, and present. Panopto does the rest. In the spring of 2013, the first test of the concept took place. Each class was divided into groups of 6 or 7 students. Each group was assigned to use one of the school’s small meeting rooms as a recording location. Setup was simple: each group used one the university’s existing laptops and a small HD camera to record themselves wherever they were most comfortable in each room. The first class session having proven successful, nine more followed over the next two days. In 48 hours, 400 student presentations were recorded, uploaded and made available to the students and the instructors via their existing Learning Management System (LMS). Not only was Panopto easy to use — it was easy to operate, too. Just two technical support staff were on hand for all six pilot test classes, and according to Morrell, by mid-semester the students were quite adept at using the systems independently. Within a few hours of class time, the students and professors alike are able to access the newly created videos in the LMS — on demand, from any device they choose. 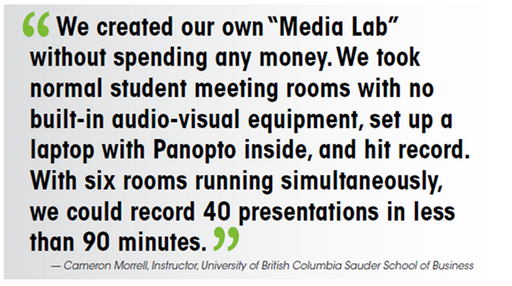 Download the Sauder School of Business Panopto case study to see how the University of British Columbia’s Sauder School of Business uses capture student presentations at scale — and all the new applications the school is finding for video all across campus.